Sony has a track-record of making big, bass-y loud speakers. Sometimes with lights on them. We have a track record of bringing them life with awesome socially-led films that demo how they’re “so loud you can see it”. The whole thing started with some rather beautiful Cymatics. That was followed by some Party Animals. Alongside the editorial they garnered, they also became some of the brand’s best performing social ads across the region (indeed the world). So this year they asked us to maintain the tradition. With a twist. This time the big speakers were … small. And portable. So that had to feature – same big sound with “take them anywhere” convenience. On top of it all, there was a Snowbombing partnership and press trip to secure and then activate. 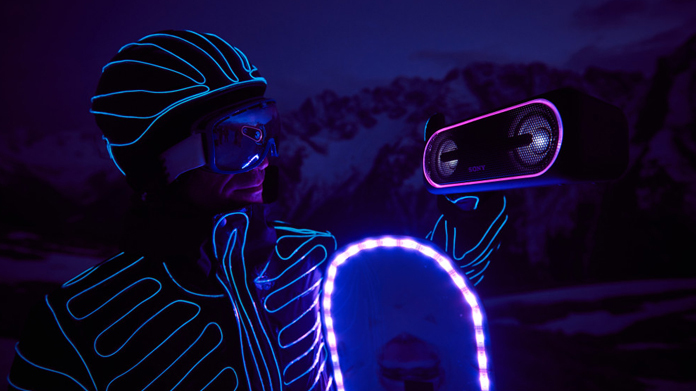 Naturally we thought it’d be fun if LED-clad Sony XB40-toting snowboarders were the folk enlisted to clear the slopes at the end of the opening day of European ski fest. Which is exactly what the team did. Armed with a banger of a film, bags of rushes and some cracking stills, we hit the media across Europe (being Sony’s lead creative shop for the region as is the role we play). Stunners followed in the Evening Standard, Daily Telegraph, Daily Star, The Sun and a host of others besides. There have also been pieces hitting our feeds from the Netherlands, Germany, Italy, Austria, Poland, Romania, Russia … it’s popping up all over the place!